I was not a huge fan of Florabotanica, the last pillar fragrance from Balenciaga, but I do sometimes like a flanker better than the original fragrance so I doggedly persist in trying them, and that's especially true when I adore the bottle. 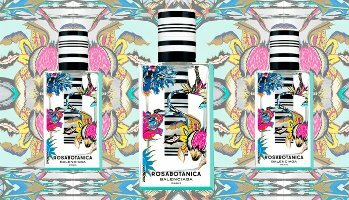 And I did adore the Florabotanica bottle. I love the bottle for Rosabotanica, the new flanker, even more. Florabotanica was a modern, clean, office-friendly floral, or as I put it when I reviewed it, "a modern, shampoo-ish blended-floral style several steps removed from the actual flowers". It was essentially loud (in the early stages, anyway) without any depth or richness. Rosabotanica is advertised as "unveil[ing] a fresher territory, with a sheer, enveloping second skin character", and yep, that's pretty much how it works out. The opening is lively and crisp. It smells to me mostly like grapefruit and cardamom, but lightly done (yes, you'll get the ubiquitous pink pepper too). There's a green-tinged floral note that is sort of like a second cousin to hyacinth (I was tempted to layer it with my L'Artisan Jacinthe de Bois, but since that one is now irreplaceable I didn't risk it); it's likewise light, but makes a pretty combination with the spicy citrus. By the time the top notes have dissipated, Rosabotanica is quiet, and feels much less floral than Florabotanica. While Florabotanica never struck me as a rose perfume in any conventional sense, Rosabotanica is even less so — the "experimental rose" is, really, experimental, and at most, you could call Rosabotanica "rose-y".2 There's a touch of fig, which I noticed more on some wearings than others — I wouldn't call Rosabotanica a fig fragrance either, but it adds some interest and just a smidgen of creaminess. The base is dry and pale and clean, with no earthiness whatsoever: the amber really is "white", and ditto on the vetiver and patchouli. Rosabotanica is an Eau de Parfum, just like Florabotanica, but the far dry down is very faint— I had to nearly douse myself to write a review, and I have a feeling there will be complaints about the lasting power. Verdict: I've already made it clear that Rosabotanica is light, yes? It's light, but that said, I found it to have more personality than Florabotanica, and to have less of a generic department store fragrance feel. If I needed something light and office-friendly, I'd certainly consider it, but I don't, so instead I considered how much better I would like it if they'd only amped up a few of the notes: the hyacinth, the fig, maybe a slightly warmer base? Still, nicely done and worth a shot. And I sure would love to own that bottle. 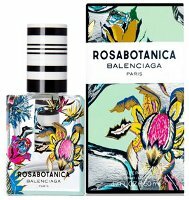 Balenciaga Rosabotanica is available in 30, 50 ($100) and 100 ($130) ml Eau de Parfum. It was developed by perfumers Olivier Polge and Jean-Christophe Herault. 1. Quotes via Neiman Marcus. 2. As I've said before, 2013 was the year of the rose flanker, when it wasn't busy being yet another year of oud, but the rose flankers all de-emphasize the rose as much as possible. The rose in Rosabotanica, besides being "experimental", was also described as "a very plant-like rose", which is sort of silly if you deconstruct it, but which fits what they've done. I was reminded of going into The Body Shop to try White Musk Smoky Rose and being told by the salesperson not to worry, the rose wasn't that noticeable. Interesting review. Have never been tempted to sample Florabotanica, though I do own a purse-sized flacon of Paris, which I enjoy occasionally. Will sample this for sure (wonder if the 30 ml size will turn up at Sephora?). The bottle is absolutely covetable. Balenciaga Paris is still their best fragrance from modern times, IMHO. That one’s Olivier Polge too. And who knows. I think lots of these 30 ml bottles never make it to the US at all. But the grapefruit and cardamom opening sounds fab! It is nearly my favorite bottle of the year. Wish they sold them empty! LOL! Can you imagine if Ambrose Bierce had written perfume reviews? Holy cow. Such a cute bottle! Thanks for the review, Robin. Which one did you like better – Marni rose or this? Oh, definitely Marni Rose. And guessing that will be true for most perfumistas. But hope people will try this even if they didn’t like Florabotanica. This one is geared younger than Marni, and while it’s not at all a silly fruity pink thing like sometimes happens when they’re after the youth market, you can tell it’s geared younger and aimed at a wider audience in general. Thank you for the review Robin. I bought a bottle a few weeks ago. I love, love, love that bottle. It’s cheerful and so is the fragrance. I spray it on before the gym because it’s light and inoffensive, plus I like the way it smells. Oh, good for you — it sounds like it’s perfect for that. And envy you the bottle. I hope they do another pillar in 2014, curious to see what bottle they’ll come up with next. Gorgeous bottle, Robin. Sadly, I didn’t win the lottery, so I’ll pass as I’m just not thrilled with Balenciaga’s perfumes. I’m so envious you have L’Artisan Jacinthe des Bois. I was checking out reviews of Traversee du Bosphore recently in the hopes that hyacinth would be a primary note as that is such a popular flower where I spent many years in Turkey, and one of my favorite scents. While it sounds lovely, it’s not hyacinth. I adore Jacinthe de Bois. Hyacinth does not seem to be an “in” note, so glad I hoarded it when I did, esp. since I’ve now given up hoarding discontinued fragrances. And L’Artisan, in general, seems to have given up the idea of pretty soliflores. I wish I’d had a chance to experience it. There are so many perfumes now that explore lokum, which to be honest is the Turkish equivalent of Rose Jello. And the ubiquitous oud. Oh my, I’m getting cranky! Since you’re not hoarding your discontinued fragrances, what ARE you doing with them? Oh, I mean I no longer go buy an extra bottle of something if I hear it’s discontinued…I just live without. I have so many bottles at this point that it’s ridiculous to buy anything, much less an extra bottle of something I already have. I’ve been curious about Jacinthe de Bois for some time, probably mostly due to Robin referencing it here and there. I’m crossing my fingers it gets reissued as part of this new reissue program L’Artisan is doing! I would be surprised if it was, but you never know. But doubt it was ever a big seller for them, and they seem to have a very different focus these days. I am kinda questioning whether this is really a flanker. I’ve always thought that a flanker would have the same initial name with something added like “L’eau” or “Light” or “La nuit de”. To me it sounds like a series and not flankers. I know I know…I can be a pain sometimes. It is, arguably, a fine point, and there are definitely series that work that way and that I would call series & not flankers. I do not see the use of the original name as a requirement, but still, you could be right. They are probably not going to use the word flanker in the press materials in any case, so no way to be sure, but certainly Florabotanica was originally presented as a pillar fragrance, not as the first in a series. – Florabotanica was originally presented as a pillar fragrance, not as the first in a series. Realized after I commented that the only “official” verbiage I’ve seen on Rosabotanica, other than the description at Neiman Marcus, is from Cosmetics Business. They call it a “follow up” to Florabotanica, which to me basically means flanker, even if in fact we see Jasminabotanica next year — and hey, hope so! But stand by my original assertion that it doesn’t matter! Brands generally don’t like to see the word flanker used by consumers though. I’ve been asked more than once to please remove it. You’ve been asked not to use the term “flanker”? Huh. Is it viewed with a negative connotation? I didn’t realize that. But in the scheme of things, what does it really matter? Ha. Negative, and/or they figure most consumers don’t know what it is anyway since it was historically only used within the industry? But it’s a useful term, and I don’t know an alternative. I hope the 30 ml bottle does become available, then maybe I could justify purchasing it just for that reason alone! Yes, and actually the wee little 30 ml bottle of Florabotanica was adorable. To me this is one of the best modern bottles I’ve ever seen. If I see this in the 30ml I think I will get it just to look at. I’m pretty sure I could wear the scent as well though even if it sounds a bit bland – there will be occasions for it. Obviously skewed young with Kristen Stewart in the ads – I think she looks better in this ad though than she did in the previous one for Florabotanica – she looked really awkward in that one. I think she looks better in this ad too, and agree, really a fabulous bottle. Great Review. Is this a lasting perfume though? I hate purchasing perfumes that don’t last. If not, do you have any other recommendations for a lasting fragrance? As I said above, the dry down is pretty faint. Just piping in to agree that I prefer this to Florabotanica. The two still have enough in common that, having not cared for the original, I won’t need to wear Rosabotanica again, I don’t think, but I do think anyone who enjoyed the first one (and I do think it had its fans!) should absolutely give this a shot–“lively” is a really good word for it. is it light perhaps so it can be worn well in the heat of spring/summer? I just don’t want to believe any negative reviews bc I waaant this perfume…for the bottle, but I want the juice to be good too. I think it’s light enough…do give it a shot! That bottle gives me a headache just looking at it.